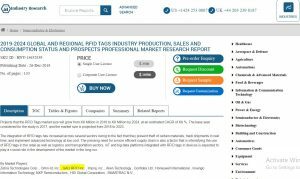 2019-2024 Global and Regional RFID Tags Industry Production, Sales and Consumption Status and Prospects Professional Market Research Report. - GAO RFID Inc. Global and Regional RFID market report analyzes the capacity, production, price, revenue, cost, sales, consumption, growth rate, import, export, supply, future strategies, and the technological developments in RFID tag market from 2012 to 2017 and forecasts the same to 2023. RFID tags ability to prevent theft of materials, track shipments in real time, and implement advanced technology at low cost makes has led to increased use of RFID Tags across several sectors. The growth factors of the market are explained in detail. GAO RFID is considered as one of the major players in RFID Tag market. GAO RFID offers a wide range of RFID tags that meet the demands of every business environment. GAO RFID tags are designed to comply with global frequency standards thus making them compatible with most RFID readers. GAO RFID offers a wide range of tags in low frequencies (LF), Medium Frequencies (MF), High Frequencies (HF) and Ultra High Frequencies (UHF).